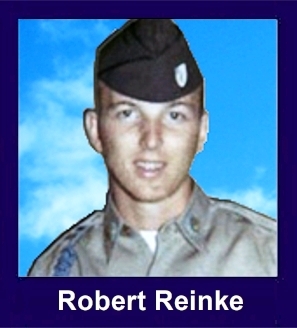 The 35th Infantry Regiment Association salutes our fallen brother, PFC Robert Harvey Reinke, who died in the service of his country on March 21st, 1967 in Kontum Province, Vietnam. The cause of death was listed as Small Arms/AW. At the time of his death Robert was 20 years of age. He was from Appleton, Wisconsin. Robert is honored on the Vietnam Veterans Memorial at Panel 17E, Line 12. The decorations earned by PFC Robert Harvey Reinke include: the Combat Infantryman Badge, the Bronze Star with V, the Purple Heart, the National Defense Service Medal, the Vietnam Service Medal, the Vietnam Campaign Medal and the Vietnam Cross of Gallantry with Palm Unit Citation. Bob and I didn't hit it off too well when we first met at Appleton High West. He thought I was flirting with his girlfriend. At a YMCA dance, he asked me to go outside and 'settle' the matter. We went outside, but nothing happened. We actually became friends after that. I really liked Bob. When you got past that tough exterior, he was really a very nice person, with a great sense of humor. He went out of his way after the YMCA incident to be nice to me. He's a hero to me. He gave everything he had for his country and for the ideals by which we live by. I have never forgotten that. You're missed, Bob.